This is made from mostly Amy Butler fabrics from her lotus line (thank you Christina!) with some American Jane pez prints thrown in there. Its my first time using grey in a quilt and I think I’m in love. Especially with the black, red & blue. Its perfect & cute for a boy (or girl?). And backed with the softest light blue minky ever. This one is definitely staying with me, it will make a perfect little car seat quilt for baby #2. The pattern is the disappearing nine patch, you can find a tutorial for it on my sidebar somewhere over there ————>. This one is small for a newborn, I think it measures 34″ x 42″. wow that is stunning. I love the way the mint green squares pop. This is really beautiful, great colors! I definitely love how this turned out! I love it! I especially love your choice for the binding. The gray looks great with the other colors. And minky on the back–perfect! That is stunning, it would be perfect for either a boy or girl. I love the grey and the green patches too. Ooh I like the gray, too. I've been wanting to do more with gray (Hope Valley, anyone??). Love the disappearing 9-patch…I am making one for my MIL for Christmas and haven't quilted it yet, but I love the way you did yours – I was originally going to do 45-degree lines, but I'm sold on your design! So thanks! WOW, that looks fabulous, I am in love. So lovely! Loving the grey, and the fabrics all go together so nicely. It looks lovely. Love your fabric combination. Oh how stunning! I LOVE that fabric! Beautiful work as always! I absolutely LOVE this. I haven't been sewing long and am a newby to the world of quilts but this is by far, my favorite quilt of all the ones I've seen. Oh wow! That is fabulous! The disappearing 9 patch was the perfect choice to showcase all those fabulous prints. LOVE. it. It's absolutely gorgeous! I love the mix of print and pattern…yes, just the perfect way to feature those fabrics! I love the color combos! I've been doing a bunch of disappearing 9 patches (thanks to you)this season. Love the colours! Baby #2 will look very chic. Are you sure baby #1 won't want it? You're right those are great color combos. I especially like how the red pops out. Awesome quilt. That is one lucky baby. I would love to hear more about quilting with Minkee? I've heard it can really stretch on you but would love to use it for a couple throws?! I like the way you've used fabrics for your baby quilts, receiving blankets and bibs that aren't traditional baby colors or prints. That's the best use of that line I've ever seen. Good compliment with teh American Jane. I love how everything pops. Great job on your fabric choices. I REALLY love this quilt. I need to check out your pattern. Very cute quilt! I am such a fan of the minky! 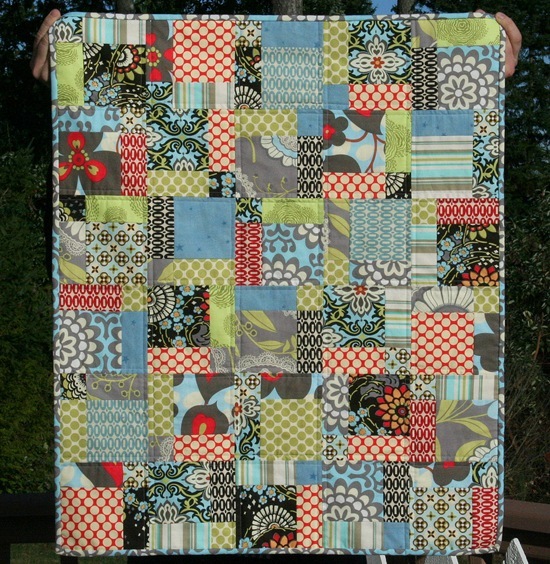 This is a really beautiful quilt…I love the color combinations. I have been looking at Amy Butler's Lotus line and have resisted so far…but now I think you may have pushed me over the edge! this is amazing and so beautiful. great job. 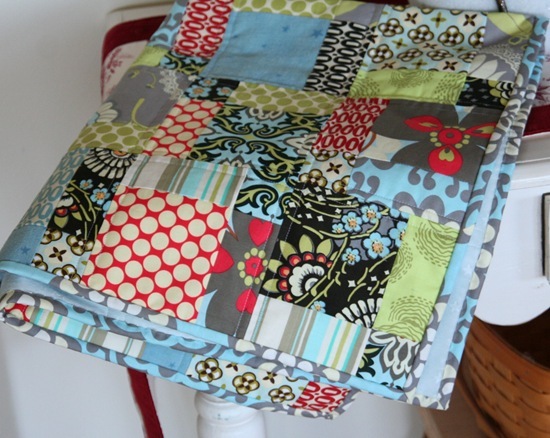 Do you quilt on the minky or before you attach it? I love having the gray in my quilt but I have not yet have the opportunity to use since its quite difficult to find any printed fabric with gray. Will be using more of my hand dyed solids. Love those fabrics. I have been working on a quilt with the red and blue Amy Butler lotus fabrics, too. Your quilt is fabulous. Can't wait to finish mine up. Pretty! Babies love those colors. It is gorgeous! You always choose the best fabric combos. Don't you just love minky? I don't know why more people don't use it. I just bought about 200 pre-cut Lotus squares and now I'm so inspired to sew them up. This quilt is amazing. Love the pattern! I love the black in this.